Developed for production applications which require accurate high speed cutting of ferrous and non ferrous material such as steel, aluminum, copper and other material such as plastic, fiber glass, resins, ect. Smoothly cut surfaces are achieved at any combination of miter and bevel angles, Use of the optional mist coolant system, is recommended for maximum blade life (cutting non-ferrous material only) while maintaining smoothest, highest quality finish. Manual (hand crank) chain carriage feed - allows for better control for carriage. Precision carriage riding on 8 wide contact double row ball bearings, providing a very smooth vibration free travel. 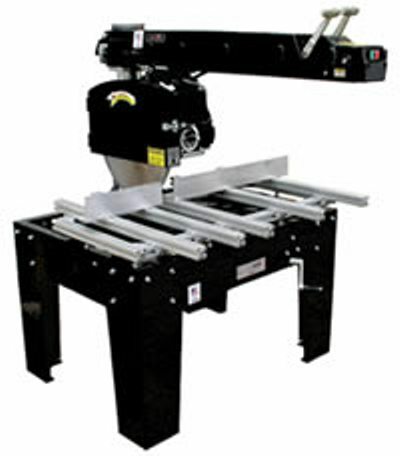 Metal cutter table, with T-Slot rails, this can ne used at cutting surface or allows for easy mounting or your own table top.